Congratulations to Skye Butler on the purchase of your new 2015 Mazda3! Congratulations to Skye Butler on the purchase of your new 2015 Mazda3! 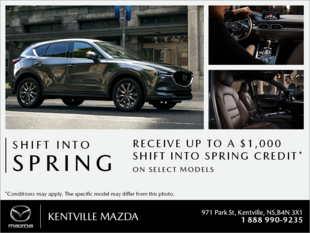 On behalf of your Sales Consultant, Darell Rogers and all of us here at Kentville Mazda, we thank you for your business, and look forward to seeing you zoom-zoomin' around in your new 3!